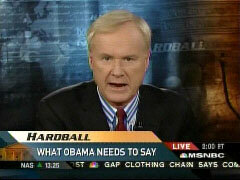 Matthews: "Good evening, I'm Chris Matthews and welcome to Hardball. The 2008 election, that's the spotlight tonight. Iowa, which starts the whole thing January 3rd, is now a dead heat between Hillary and Obama. Here's what I think Obama should say, starting tomorrow night, at the big MSNBC debate in my hometown of Philly. Quote: 'This country is in a rut. A rut that leads to endless war in Iraq, that leads to inevitable war with Iran. The American people and not just the Democrats want to get our country out of this rut. The great majority of them want this election to take us to a new place, not just led by someone smarter along the same rut. I promise to take us to that new place. Senator Clinton is smart, she's hard-working, she's serious but every vote she has cast, every word she has spoken says yes to the status quo. She voted to approve the war with Iraq, she just voted with the hawks to target Iran. She always seems to choose the safe vote that leaves this country in the same rut - the rut of fearful politics and endless war. I promise change, I promise a new approach. I promise deliverance from the rut of endless war in Iraq, inevitable war in Iran. So there you have it. It's for you, my fellow Democrats, to decide. If you think Bush would have succeeded with his policies, if they were better executed, then go with Senator Clinton. If you think the Bush policies were wrong, dead wrong, I'm with you.' Well that's what Senator Obama would say if he really wants to challenge Hillary Clinton for the leadership of the Democratic Party."